There is a lot of us/them in the science fiction community, the common perception being that the literati draw a line in the sand between genre and literary fiction, no crossing allowed. (For the record, I view mainstream fiction—Lee Child, James Patterson, Nora Roberts, and other popular “realist” writers—as being the same beast as mainstream science fiction. Literary fiction is a different animal.) “They don't review our books.” “They don't put our books on award ballots.” “They don't take our books seriously.” Yes, us/them. What most of the science fiction community doesn't realize (predominantly because they rarely if ever actually read literary fiction) is that literary fiction is not a club intended to keep the riff-raff out. It has a commonly enough agreed definition (see here or Oxford Dictionary of Literary Terms), and if looked at closely, does not specifically exclude any genre, let alone science fiction . 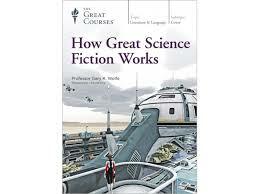 This is what makes Gary K. Wolfe's The Great Courses: How Great Science Fiction Works so damn bothersome. One of the introductory quotes in K. Wolfe's lecture series is: “Most of what we'll be discussing in this course is the literary side of science fiction... and what makes for a great science fiction story as opposed to a run-of-the-mill space adventure or monster tale.” Like Aldiss before him, Wolfe then launches into how Mary Shelley, H.G. Wells, and Jules Verne pioneered early science fiction. Well enough. But then, Wolfe gets into the pulp era, and it's here the aspiration to distinguish “great science fiction” from the “run-of-the-mill” variety begins to trip up. And it only gets worse. By bringing more and more mainstream sf writers into the mix, K. Wolfe stumbles. While significant to the history of science fiction and popular among readers, the majority of science fiction, just like realist fiction, or romance, or horror, etc., is and was written for entertainment purposes. Wolfe does discuss books like John Brunner's Stand on Zanzibar, Ursula Le Guin, The Left Hand of Darkness, or Theodore Sturgeon's Venus Plus X, just to name a few. But for every Bradbury, Tiptree Jr., Ballard, or Robinson getting mention, there are more references to books like Edgar Rice Burroughs A Princess of Mars, Anne McCaffrey's Dragonflight, Alastair Reynold's Revelation Space, A.E. Van Vogt's Slan, or Leigh Brackett's Sea Kings of Mars, not to mention two whole lectures devoted to space opera. K. Wolfe even takes several minutes to discuss Hugo Gernsback's laughable Ralph 124C 41+. By failing to identify these and many of the other novels and stories as popular fiction, Wolfe likewise fails to achieve his goal of exemplifying “great [read: literary] science fiction”. After all, there is a reason we don't give Nobel, James Tait, or Pulitzer prizes to the likes of Clive Cussler et al., and the same holds true for Asimov et al. Further issues with the course evolve. In the lecture that attempts to define science fiction, Wolfe makes the case literary science fiction is grounded in real science. I would disagree, but I'm willing to consider the definition if applied consistently. It's not. The likes of Anne McCaffrey, Edmund Hamilton, and other writers of cosmifiction (to borrow a term from Paul Di Filippo) are brought into the discussion. (Sorry, but McCaffrey is a writer impossible to take seriously. Mechanical dragons can be literature—see Michael Swanwick's The Iron Dragon's Daughter. In McCaffrey's hands, it's My Little Pony in space—at best.) In making his point, K. Wolfe attempts to draw a distinction between Wells' non-science fiction man traveling to the moon using a made up, fantastical means (i.e. a spaceship) whereas Jules Verne's uses a means with a more scientifically rigorous explanation (i.e. cannon, cannonball , and scientific hand-waving). Am I the only one who sees the humor here? But pulling the rug out from under his own feet, in a following lecture when discussing time travel K. Wolfe openly admits that the tools and devices used are fantastical, in turn contradicting his earlier point that science fiction is grounded in real science. Weak sauce. From the umbrella perspective, Wolfe does a good job covering the length and breadth of the science fiction field. He knows his stuff, and the language he uses is intellectual and informative. I would also say that Wolfe does a great job breaking science fiction down into categories and components that suit the lecture series well. The listener gets everything from feminism in science fiction to the symbol of the spaceship, science fiction's New Wave to environmentalism, and the evolution of sf stories that trod these paths. Likewise, Wolfe is quite good at connecting science fiction to larger cultural or social movements. But again, the usage of the word “great” as equating to “literary” throws a major wrench in the proceedings. In the end, How Great Science Fiction Works is a lecture series that would purport itself to champion literary fiction of a science fiction bent, but given the heavy, heavy dependence on popular entertainment, in fact remains one of the barriers preventing science fiction from being taken more seriously by the literary establishment—largely infotainment for a largely pop literature. Thus, if you're looking for a champion of middle-grade science fiction that stands by the us/them perspective , by all means check out K. Wolfe's lecture. It will only make you feel good. If, however, you believe great science fiction to be of a higher caliber, do yourself a favor and read Brian Aldiss' Trillion Year Spree or Adam Roberts' The History of Science Fiction. You will get a more erudite overview of the genre with far less blustering, contradictions, and delusion.